I’ve been pretty open about my inability to properly dress myself for a while now and I am SO excited to be stepping out of my comfort zone and trying to learn some new ways to wear clothes that flatter my figure by enrolling in the fashion challenge (still time if you want to join- outfit combos start being sent out on Sunday). When Ashley first told me about the challenge I almost passed it up because it sounded too complicated, but I’m so glad I did it because now I am dancing around in some fall staples, eager for the first outfit combo to be sent out. Many of the people in the challenge had most of the staples already in their closet. I, on the other hand, was pretty much starting from scratch after being pregnant/nursing/drinking copious amounts of wine in between the aforementioned for the past three years. So I set out with the shopping list to buy some new items. I spent a little more on the things I’d know I’d wear (comfort zone) and went less expensive on some of the items out of my comfort zone. I figured if I loved the item, I could invest in a more quality piece next season. 1. Plaid Scarf (comfort zone) – Though I need to learn different ways to wear a scarf, I liked the colors and knew it could be paired with many items for many seasons to come. 2. 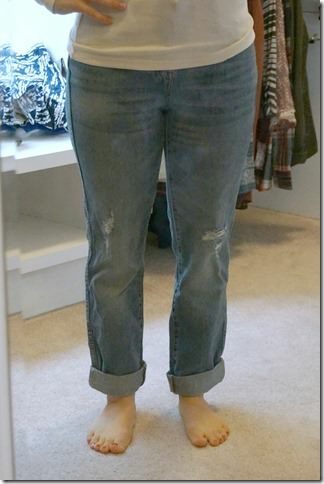 Boyfriend jeans (not in my comfort zone) – Can I pull off the cuff being that I’m only 5’1”? Is the ripped look still in? Should I really stray from my beloved dark wash jeans? Somehow I let the sales associate convince me I should get these. Jury is still out. 3. Comfy Sweater (comfort zone)- This is something I’d totally buy on my own. I like the color and it’s beyond comfortable. I think pairing them with gray jeans helps make it more fashionable? 4. 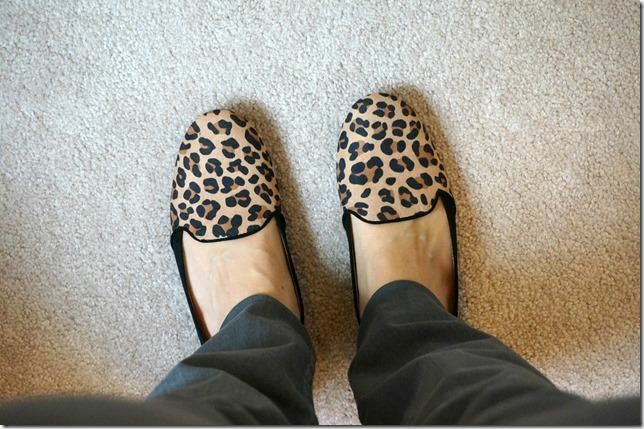 Leopard Flats (not in my comfort zone)- So leopard is a neutral? I’m not sure I understand what people mean by that. Looks pretty bold to me! 5. 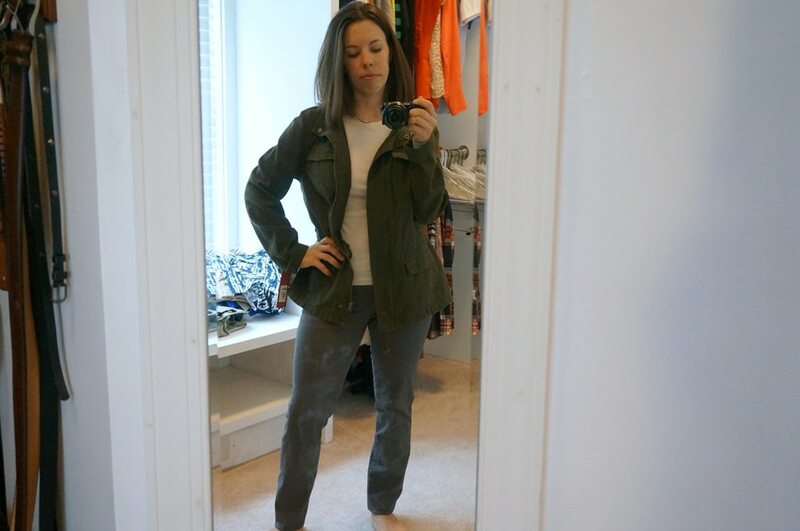 Military Jacket (from Target- couldn’t find the link) – originally I would have said out of my comfort zone, but now I think I could throw this on fairly easily. And look how angst-y and modelish this shot is (HA). 6. 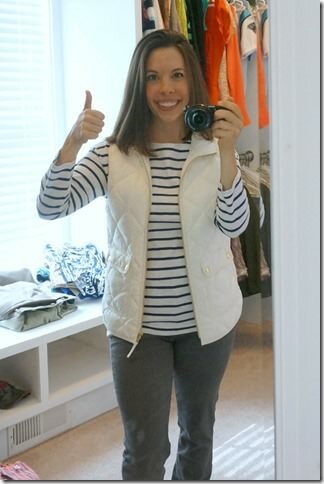 Quilted Vest & Striped Shirt (comfort zone!) – I love this vest and will go ahead and apologize for the 100 million times you will see me wearing it. 7. Plaid Shirt – I feel like I’m swimming in it (it’s a large), but the smaller sizes wouldn’t allow me to lift my arms. Not sure about this one. 8. Gray Cardigan (comfort zone) – Stitch Fix (affiliate link). So soft and comfy. Love me some cardigans! 9. Leopard Scarf (not in my comfort zone) – eh. I don’t know how to style it and still not sure leopard is for me. Stay tuned! So there you have it- some of my new items! I’ll share full outfits (if you want me to) once we start getting them and let you weigh in. I can say that whatever the outcome, I’m pretty excited to have some new goodies in my closet ready to go. What is one item of clothing that is out of your comfort zone but you’d like to try? 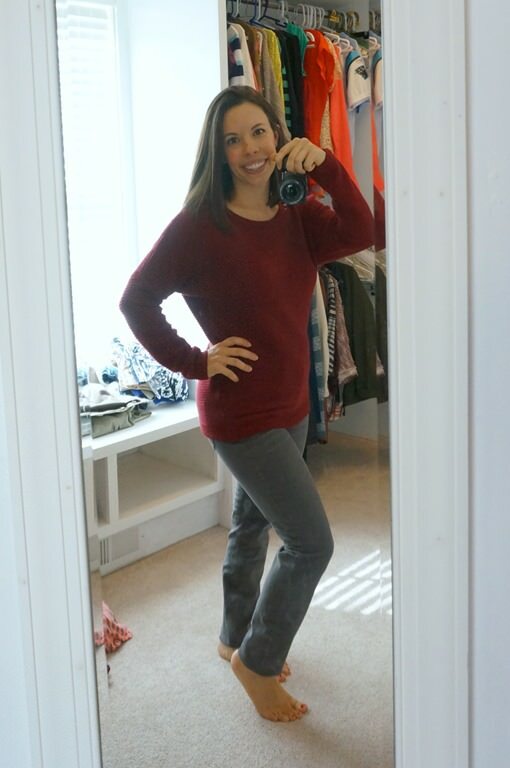 I almost never venture away from dark jeans, so I’m really excited about my gray jeans. Now I just need to learn what to do with them! Like you, I love, love, love a vest! I wear mine all the time! For us shorter gals, a darker, skinny jean helps elongate us. I feel that frumpy jeans make me look like a big tub of goo. I go with how I feel in an item over what’s fashionable. Very cute clothes, and I loved the post! I was apprehensive about boyfriend jeans too but they are so much more comfortable than skinny jeans. You can wear them with flats, heels or boots. I also had a hard time with leopard as a neutral but it really does go with a lot: red, olive, black, brown, etc. Out of my comfort zone but wish I could learn to wear properly…belts! I NEVER wear belts. I am high waisted/long legged and tall and feel like belts make me look even more disproportionate. But I have a light weight sweater dress I bought on sale at the end of last season that would really benefit from a belt but I just don’t know what belt to buy and how to wear it. Thanks Rachel for the reply. 🙂 I definitely need to go belt shopping! I loved this post just because it is sooo different from what you normally post — don’t get me wrong — I love what you normally post, but change is good. I used to be a real fashionista — but only when it came to work clothes. When it came to weekend & casual wear, I always struggled. Now that I’m a full time mom and all I wear is weekend/casual wear, I have to say that I sometimes miss my old closet of office awesomeness. I don’t worry too much about what I wear around the house and during errands. Thanks for sharing your potential fall outfits. I loved some of your questions (leopard is a neutral?!) and I think it’s fair to say you can rock any of these items, whether they’re in your comfort zone or not. It’s all about having the confidence to wear it — nothing looked too bizarre! 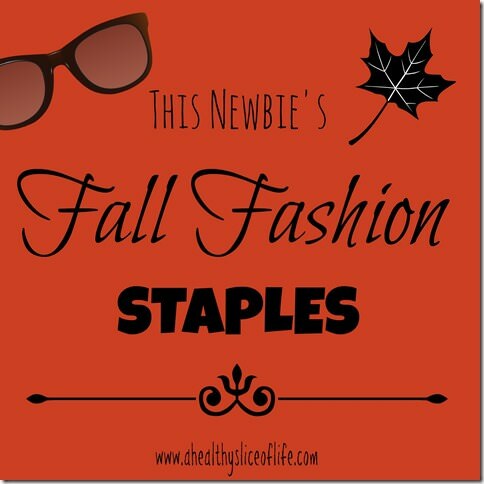 What great staples! I especially like the sweater, vest, and cardigan. Oh, and the gray jeans! At first I wasn’t sure about the colored jeans trend, but I embraced it a couple years ago and have grown to really like it. In fact, I’d say that – and scarves – would be my fall staple! Shari recently posted..Wordless Wednesday: Jasper Jellybean Jax. What a fun post! I love scarfs and boots and vests in fall. It’s my favorite time of year for clothing. I really like everything but the boyfriend jeans. It will be interesting to see how to style them because I like the idea of them but I feel they look sloppy and un-flattering when I try them on. My fall/winter fashion pet peeve is that it’s too cold here to not wear socks so I wear a lot of boots or just rock socks with my work shoes. It looks bad (I think) plus I never know if I should match the socks to my shoes or pants or what. Thankfully my office isn’t a fashionable place. So glad you posted about this since I am also doing the fall challenge! Did you get the plaid shirt at Target?? I tried mine on this morning and the sizing was crazy. I got a medium thinking that it would be roomy since I’m usually a small or medium and they were too tight. Mine are going back and I am trying again on that piece. I also am completely unsure of the boyfriend jeans. I have even been avoiding shopping for that item as I really don’t know that they’d work on me. I will be doing it soon though as this challenge should get me out of my comfort zone so I’ll embrace it! Yes the plaid is from Target and I think I’m returning it too! As with the boyfriend jeans. I think the crowd has spoken and I just can’t pull them off. Let me know if you find a great plaid shirt! I LOVE plaid shirts but I always feel like a dork when I try one on. I got a plaid shirt from Target a couple years ago and it fit until I washed it, so tiny! What’s up with that? I think it really helps to take photos in your clothes. Sometimes I think an outfit looks great then I see myself tagged on fb or IG and I’m shocked at how unflattering it is. That said, the boyfriend jeans and the plaid shirt seem to be swallowing your figure. I like trends but also think it’s best to rock what works for you with accessories to spice it up. 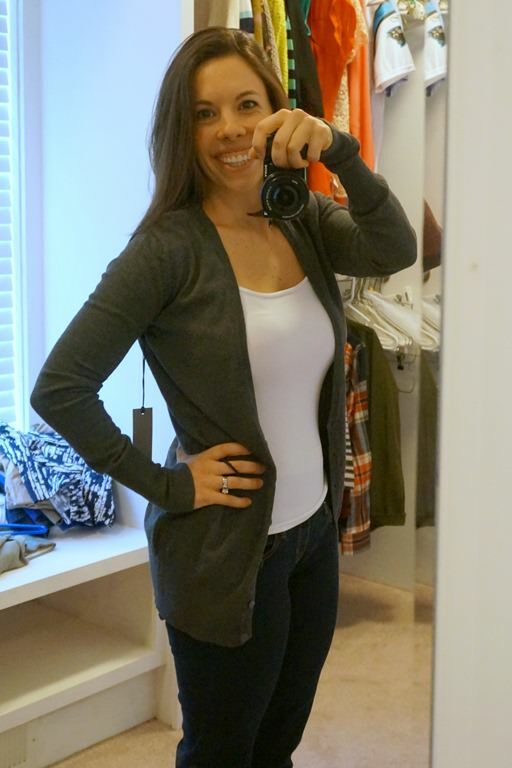 The dark jeans, slim tank, and cardigan are a really flattering and classic look for you! Totally agree! The boyfriend jeans and plaid shirt do nothing for her figure, and she has a great figure. yep, agree!! You have the cutest body, and those jeans don’t do anything for you! Thank you for the (nicely worded ;)) feedback. I think y’all are right- the boyfriend jeans need to go back! I also agree that clothes look so different when photographed. I feel like Cher from Clueless, but it definitely helps to snap a picture! Cute! You gave me some good links to things I have been trying to find for awhile, like a good plaid scarf and the sweater. With the boyfriend jeans, it looks like you got a regular length? I always try them on then wind up not buying them because I’m only just over 5ft tall. I would either try exchanging for a petite version to get the length/leg width smaller, or do what I do and cuff your skinny jeans and wear booties with those! Granted, I got them on sale for $99, but they’re real leather, beautiful design, and have a very short shaft so they do not cut my already petite legs up into strange lines. Try to find something like this if you wind up puzzling over booties (why the name? I pay what for only half a boot? these are real things I’m weird enough to think about). LOVE your tips- thank you! I think I am going to return the boyfriend jeans and I did just buy a pair of booties (hate saying that word though), and am nervous about how exactly to wear them. I also need to find a pair of dark skinny jeans that fit a petite frame. Any suggestions? The thing I finally figured out with booties is that the lower the shaft, the better for a petite leg – which also means your jeans will NEVER fit inside the boot itself..awesome. So what you do is you roll the skinny jeans up 1 or 2 times with a 1in cuff, and you wind up with them ending maybe a half inch above where the bootie starts. So nothing looks bulky, all of the horizontal lines you’ve now created are streamlined, and your frame is not overwhelmed by fabric. Bonus: this is how you get that “ooh I’m so casually thrown together except my boots were $400!” look. Obviously what I strive for. Go to Target and check out the new line of Levi’s called Denizen. They are only $27.99, and they are fantastic. I was shocked at how much I love them. You are shorter than me as I am 5’4′, but you should check these out. Leopard print flats are one of my favorite things ever! I want some of the ones that you have on though, as mine are pointed toes. 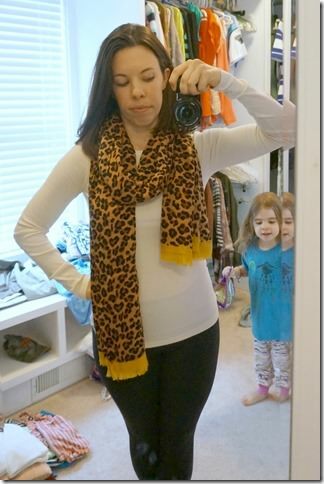 Love Hailey in the back of the leopard print scarf picture, haha! I love everything you got for this challenge – super cute!!! I do think the plaid shirt is too big though. I was unable to find a plaid shirt at Targe that fit me too. Everything was too tight across the bust/shoulders. I think I’m going to check out old nave. Also, Loft is have a 50% off sale today and they have a really cute leopard scarf in the black gray tones that would look cute with your gray jeans, etc. I’m excted for this challenge too. I am still trying to decide between the JCrew vest and the one from Old Navy. Thanks for sharing!!! I love that burgundy colored sweater! My stable are SCARVES! LOVE them! Carrie (This Fit Chick) recently posted..Just, FOOD! 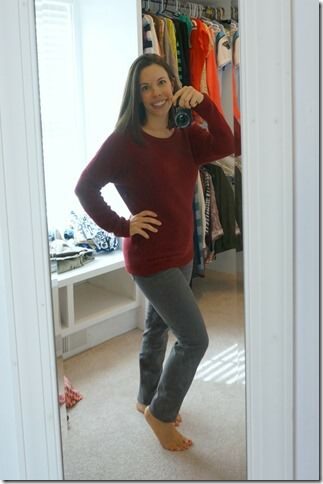 My favorite fall staple is a long sleeve tissue t-shirt (JCrew) paired with a hoodie-sweater (also JCrew)! It’s so comfy and I love dressing in layers because it’s always cold in the morning/evening and warmer during fall days! I think you have a great start and looking forward to seeing what outfits you put together. I feel the exact same way about button up shirts. They also feel so constricting in the arms/back area and I have to go up a size, which drowns me and my nonexistent chest. I recently purchased a chambray one from Old Navy and hoping it works out! Fun post! I want to see more! Maria recently posted..Out with the Old? This is GREAT! Thanks so much for posting about the challenge last week, I totally signed up! You can totally ROCK the leopard, don’t give up on it yet! I also think the plaid shirt is too big, we need to find you a better fitting one. YAY Can’t wait to get the outfits on Sunday! Thank you for the tip! I’m going to check that out because I think I’m returning the boyfriend jeans I had. Just not flattering! I have a similar military jacket and I love it! It seems to go with everything. 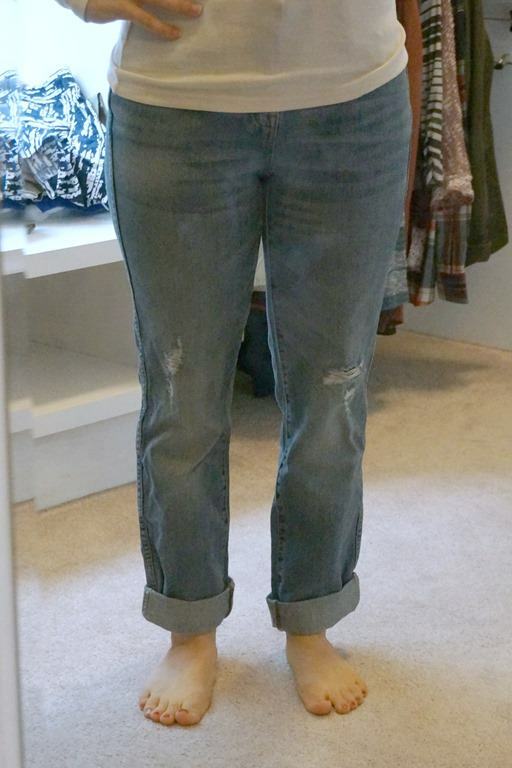 I also had a hard time with boyfriend jeans but I found that a Banana Republic pair that fits really well (I bought them from a consignment shop) and they are now one of my favorite things to wear! They aren’t too baggy and are sort of cropped so my ankles peek out which I think helps with elongating the leg. I’m looking forward to more of your fashion posts! Great items that you picked out. It can be nerve racking to leave the comfort zone, but I can’t wait to see how you style these with the challenge. Scarves are my go-to fall piece. Something I wouldn’t normally go for but think I might try this year is a mini, short cut boot. I am so not a fashionista but I want to give these a try! I LOVE that vest!! I also happen to love ripped jeans so I say so for it! 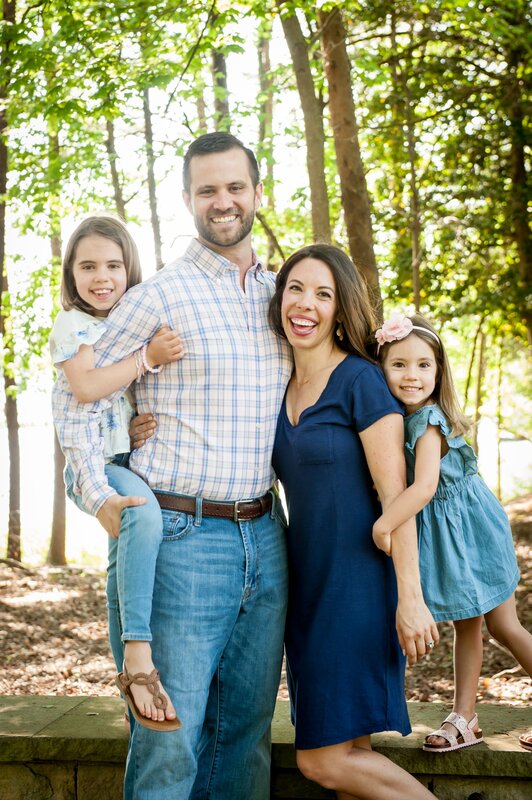 John J. Stathas recently posted..Our Anniversary: Vows, Music, & Life!! Yours? Yay! You found some cute stuff. 🙂 I’m not doing the boyfriend jeans thing. I have a pair of skinny jeans I’ll cuff and call it good. They have some cute plaid shirts at Old Navy! Maybe you some them there, but I’d check ’em out. So excited you’re doing the challenge! I’m looking forward to seeing the outfits you put together. WOW – I have 90% of these items in my closet! LOVE haha. I love the cardigans you have, especially the gray one! I agree with everyone else. Skip the BF jeans and cuff a pair of skinny jeans instead. The grey jeans look great though! You can definitely pull off a plaid button up. Look for a petite fitted one. I prefer them without pocket flaps because it can be overwhelming on a small frame. I need to be better about buying staples along the way. Instead of waiting until I “need” something and trying to search online/ the mall for it. love this post, and the whole concept! i agree with others about the boyfriend jeans — I think a skinny jean is the perfect look for us shorties 🙂 i do think a boyfriend-type style COULD work on us but it would need to be more fitted, i think. LOVE the grey ones on you! now i am eyeing them too!! i like the plaid shirt but i do think it is a little too big for you! 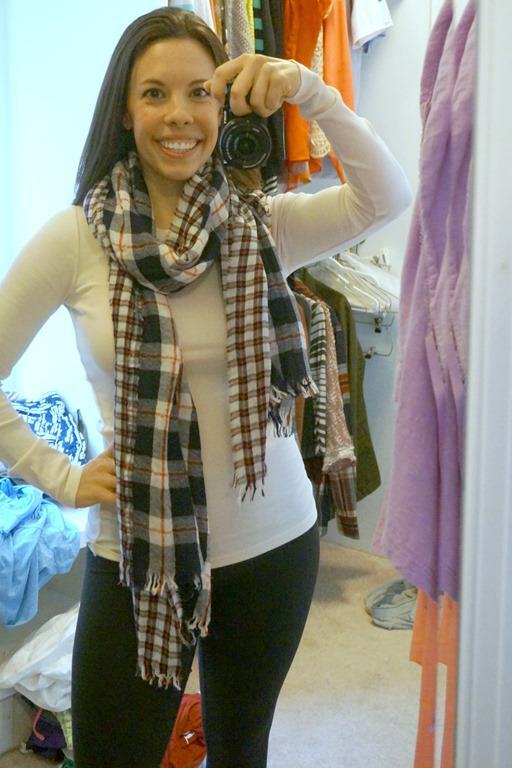 the first outfit (plaid scarf) might be my favorite! SO cute on you. and – definitely agree that leopard can be a neutral 🙂 🙂 will be excited to see how you mix it up. i love the shoes. My newest attempt in venturing out if my comfort zone is the acquisition of a true red lipstick. I went to a wedding this past weekend and am going to another tomorrow and my dress is black, white and red so I figured it was time to accessorize..with my face! One wedding down and one to go and I just felt fab and so put together! Love the striped shirt and vest but not a huge fan of that plaid shirt, I think it’s too big and boxy for your petite frame. A fitted button up would be more flattering. The comfy sweater is something I would steal from you for my own closet! I just ordered something similar from Old Navy so hopefully that works out for me. Brittany you should check out the relaxed skinny jeans from Loft! I absolutely love them… Cross btwn boyfriend and a skinny jean. They are super comfy and flattering. I would suggest sizing one size down. As a busy of mom of two young boys.. I love wearing plaid shirts and jeans, my military jacket and also boyfriend cardigans and flats/riding boots. I Love a great boot. Worth the investment in my opinion makes you look polished. Love the Hailey photobomb in the last picture! I love what you bought! I am also 5’1 and trying to rock boyfriend jeans and found that old navy has some great options! They also have inexpensive vests and plaid shirts!